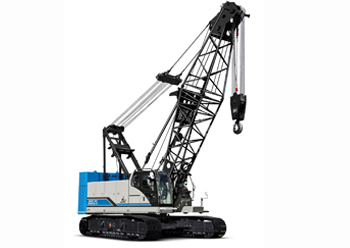 Hitachi Sumitomo Heavy Industries Construction Crane Co Ltd (HSC) has launched the SCX800A-3 80-tonne capacity hydraulic crawler crane. The new model is equipped with an engine that complies with EU Stage IV and US Tier 4 exhaust emission regulations and has been designed to offer customers a lower cost of ownership due to its exceptional reliability. HSC engineers have incorporated several new features in the SCX800A-3. Its compact design gives it the smallest rear-end radius in its class and makes it ideal for working safely in confined spaces and narrow job sites. The powerful new Cummins QSB6.7 engine features an auto-idle stop function, which prevents fuel wastage, and reduces exhaust and CO2 emissions. The winch has an environmentally friendly design. Using the eco-winch mode ensures economical operation with low fuel consumption. In addition to the standard 7t rated line pull winch, an 11t rated high line pull winch is available as an optional extra. The winch brake uses innovative hanging brake pedals. It offers enhanced performance and greater control in various working conditions following a review of the link structure and limit changes in control feedback caused by the weight of hoist items. Safety was an important factor in the design of the SCX800A-3, which features a swing restriction device, swing brake pedal and folding upper house handrails. A warning alarm and auto-drum lock are installed as standard. The large display panel in the cab shows operators all the required information at a glance and in a functional easy-to-view layout, without hindering forward visibility. A new remote monitoring system has been developed to check the crane’s condition and status accurately online. Using the remote sensing system helps owners to minimise downtime, and reduce the costs required for maintenance.